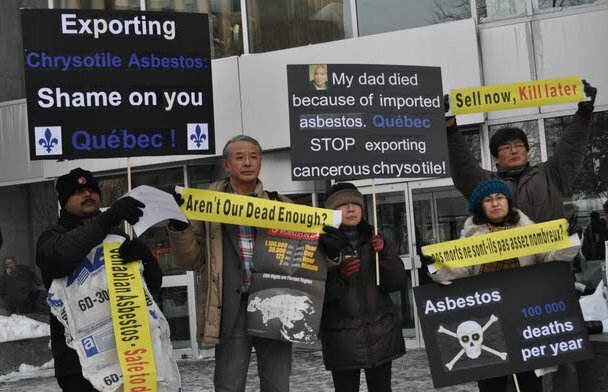 Members of the Asia Solidarity delegation to Canada protesting outside Premier Charest’s Montreal office, Dec. 10, 2010. 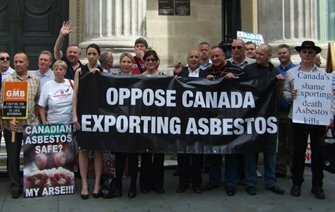 Luis Cejudo Alva, the president of the Mexican asbestos lobby organisation, InstitutoMexicano de Fibro Industrias, told the BBC how the Chrysotile Institute has paid him to lobby to defeat efforts of Mexican health professionals to get asbestos banned in Mexico. Watch Rick Mercer’s Rant on Canada’s outrageous behavior on asbestos. Rick’s rant aired on September 20, 2011.